The cold has officially crept in and November is in full swing. And in our house that it’s SOUP SEASON. Cheesy, I know, but nothing is better on a cold day than hot soup. My roommate Brigitte is a soup queen and created a modified minestrone last night. Delicious, healthy, and on the table in under a half-hour, an all around success. Sautee 1 cup carrots, 1 cup onions, 1 cup celery, 4-5 garlic cloves in oil until translucent about 5 minutes. Next add 1 15 oz can of chickpeas (rinsed and drained) and 1 15 oz can of diced tomatoes. Then add 4 TBSP of fresh (2 TBS dry) herbs-I used parsley, basil, oregano, & italian seasoning-but you can use whatever you have on hand/season to taste. Add 4 cups of chicken stock. Add about 2 cups of diced chicken, or whatever protein you prefer (turkey, sausage, etc). Simmer for at least 20 mins. 7-10 minutes before serving, add 1 cup of pasta (I used elbow, but you could use shells, bow tie, penne, etc) and 2 handfuls of greens (I used red spinach from TJ’s) but you could use regular or kale or omit if you prefer. 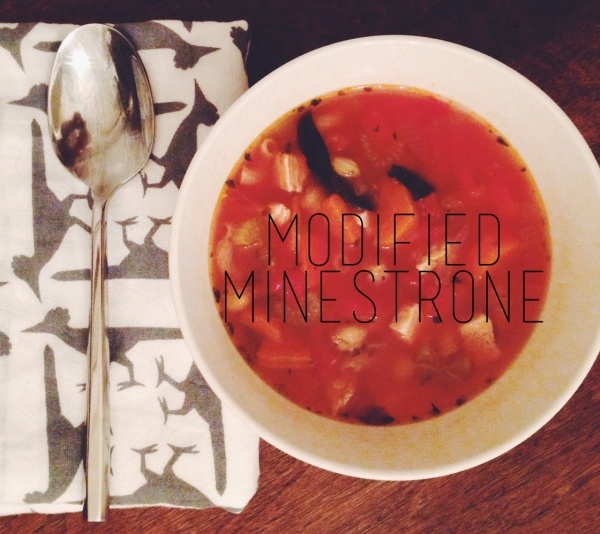 This entry was posted in cooking and tagged minestrone, recipe, soup. Bookmark the permalink.